Screencast-O-Matic on Chromebook has a ton of publishing options at your fingertips. It’s easy to upload and publish your recordings with just a few clicks. Upload to Screencast-O-Matic – In its NEW feature release, users can now upload to Screencast-O-Matic’s hosting services. It’s a convenient way to publish and share videos. Once the video is uploaded, you can share the Screencast-O-Matic link directly on social sites including Facebook and Twitter. To save to Screencast-O-Matic, click on ‘Upload to Screencast-O-Matic’ and fill out the fields. Click ‘Publish,’ and it will save to your Screencast-O-Matic account. Copy the link and share! Save a Video File – If you need to save a file, you can save it directly on your Chromebook. To save, click on ‘Save as Video File,’ fill out the fields and hit ‘Publish.’ Once it’s uploaded, it will save as a .webm file. Upload to YouTube – YouTube is another great option used by many bloggers. Screencast-O-Matic has made the process easier. Just connect your YouTube account, and it will directly publish to your channel. To get started, click on ‘Upload to YouTube’ and fill out the fields. You can choose privacy settings as well as select a YouTube category for your video. Draw and Highlight, Mouse Effects and More! Recording with Screencast-O-Matic on Chromebook is fun when you take advantage of all of the tools in your recording. Draw and Highlight – You can draw and highlight specific things in your recording. For instance, many teachers recording a video tutorial can draw and emphasize certain areas of the screen. You can easily draw and highlight by hitting ‘Record’ and pressing the shift button. Just drag your mouse or finger (if you have a touchscreen) and draw away! Mouse Effects – With mouse tracking and click effects, your viewers will quickly see where your mouse is on the screen. It helps to track the movement of your video and will be easy for your viewers to follow. This is an automatic feature when you are recording on Chromebook. Trim Edit – This feature enables you to cut the beginning and end of your video. This helps you edit out the ‘dead space.’ After your recording is done, drag the bars that are located at the start and end of your video. Drag them to your desired beginning and end, and anything within the bars will be uploaded. Audio Narration and System Sound – Add your own voice or narration to personalize your recordings. You can take sound from your computer’s speakers. It enhances your Chromebook recordings with personalization. Unlimited Recordings – Screencast-O-Matic makes it possible for you to record as many videos as you want. There are no limits to the number of videos you record. Recording Time – If fifteen minutes is not enough then switch to Deluxe plan for Chromebook to gain access to unlimited recording times. 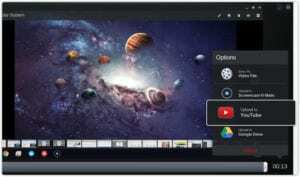 The videos you create on your Chromebook can easily be accessed on multiple devices. A Chromebook deluxe plan gives you access to our advanced tools on your PC/Mac. 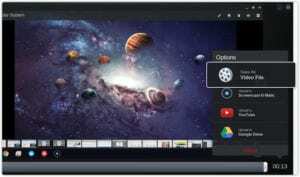 You can easily import your Chromebook files to your PC or Mac and enhance your video using our advanced editing tools. 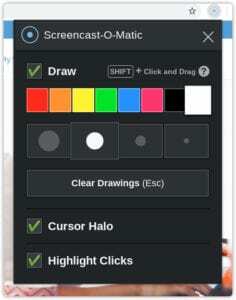 Screencast-O-Matic is continuing to enhance features and add new ones. Continue to check our blog or subscribe to our email for the latest news on feature enhancements.